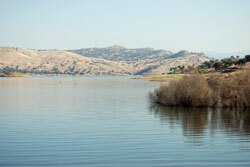 Millerton Lake State Recreation Area offers great boating, camping, and fishing to Central California residents. It has swimming and water skiing, hiking, and other outdoor recreation, including Bald Eagle Boat Tours in the winter. Millerton Lake is located only 20 miles northeast of Fresno. The reservoir was built by the Bureau of Reclamation as part of the Central Valley Project. Access to the lake is via the Millerton Lake State Recreation Areas. Millerton Lake has miles of open water for all kinds of boating. Water skiers and wake boarders play all summer long on the sparkling water. Pontoon boats cruise the lake, providing a base for fishing, swimming, and exploring. Fishing boats work their way up the long San Joaquin River channel into secluded coves. Several launch ramps are located around the lake. Millerton Lake has only a single marina, but there are two boating renting companies. One offers rentals next to the marina and the other a little closer to the dam. 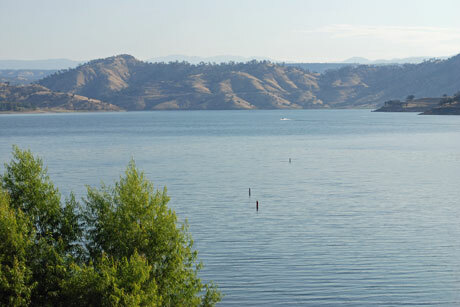 Millerton Lake has a wide variety of fish, including several kinds of bass and trout. Most anglers head up the San Joaquin arm of the lake where water skiing is not allowed. Kayak fishermen like fishing in Millerton Lake. Millerton Lake State Recreation Area has most of its campgrounds at the North Shore recreation area. They have great amenities such as showers and some electrical hook-ups. There is also one Boat-In campground and another location where boaters can spend the night if they have the proper sanitation facilities aboard. Millerton Lake lodging is almost non-existent. The closest motels are in the Fresno area, 20 miles away. Otherwise, visitors could drive 30 miles up to Oakhurst where there are more choices. Millerton Lake is surrounded by low hills blanketed with grass and scattered groves of oaks. By mid-summer the hills have turned brown. Millerton Lake is about 20 miles from Fresno and Madera. The little community of Friant is adjacent to the lake and offers some basic services. Table Mountain Casino is located just 2 miles east of the lake on Millerton Road. Every effort is made to provide accurate and up to date information, but we cannot be responsible for errors or changes that may have occurred since publication. Always confirm information with the service provider and check for any recent changes that may have been made. The information provided on this website is done so without warranty of any kind, either expressed or implied, including but not limited to, the implied warranties of merchantability and fitness for a particular purpose.